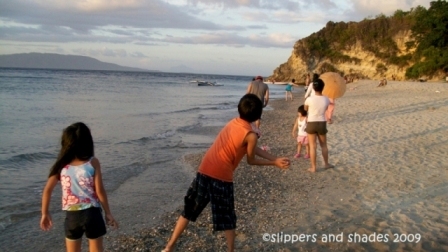 My hubby fulfilled his promise to our kids when we left them for a three-day beach getaway at Puerto Galera in Oriental Mindoro last January. And what was his promise? That we will go back in this beautiful island with the whole family if he will enjoy his stay. Certainly, he did. 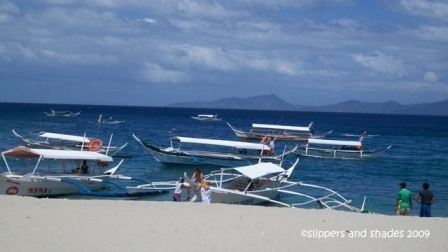 White Beach in Puerto Galera almost resembled to the famous Boracay because of its creamy white sand, crystal blue waters and the maddening crowd especially during summer. But White Beach is a budget-friendly destination that’s why bringing the whole family will not tear a gaping hole in one’s pocket. Foods, hotels and even cost of transportation are affordable. And one good thing, travel time from Manila will only take almost three hours in getting there. 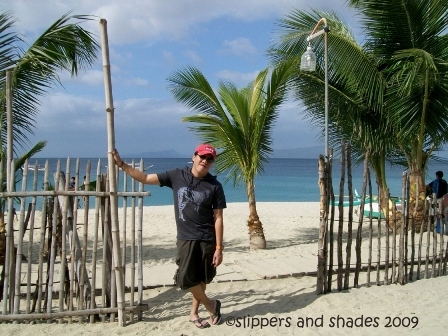 Aside from our kids, we enjoined my mother, Miko and Isha in our beach escapade in Puerta Galera. We boarded in Tritran Bus near Gil Puyat LRT Station around 6 a.m. Fare-P166.00. Travel time took us only 2 hours going to Batangas Pier. Boat fare for two-way ride-P450, environmental fee -P50. The weather was so cooperative and so we had a nice boat trip. But just like my previous trips, we were welcomed by surging waves when we were passing the rough part of the journey, the “channel”. I was worried because we never tell our mother that our water trip will take an hour. She had this fear traveling across the sea. But thank God the experience lasted for few minutes only. We had a room reservation at HSL Beach Resort again. Ate Marie had welcomed us with her warm accommodation. Since we were all seven, previous room rate of P800 increased by P400. We paid P1,200 for one day and one night stay. It was so affordable to a budget traveler like us. We ate our packed lunch in the dining area of the resort. The kids were so excited to swim. It was noon time and was flickering so we stayed in the room and took some rest. 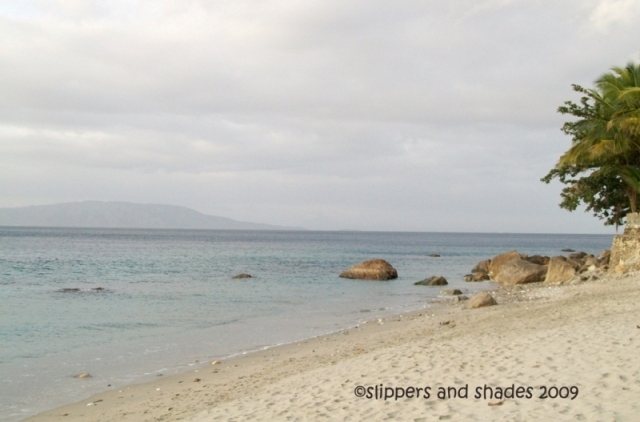 At 4 pm, we started to explore the long stretch of creamy white sand. White Beach was crowded by people enjoying various activities. There was the banana boat ride (P300) and kayak (P200). 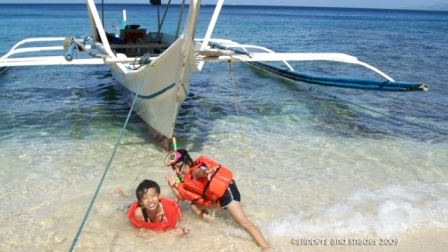 Pao and Isha were so excited to try the banana boat. But they were little so we did not allow them to ride on it. We refreshed ourselves in the clear water, later mingled with the crowd and frolicked in the shoreline throwing stones to the water. One of the best memories I had in White Beach is the sunset photo. While everyone was busy, I savor the moment watching the sun slowly setting down. It was a beautiful sight to behold. This was my third time to step to this island, but this was the moment I fully enjoyed watching the golden hues reflecting to the stillness of the water. It was getting dark when we headed back to our room and changed our wet clothes. We missed a table in Hiyas Restaurant for our dinner. It was full. Its comedy show had already started and the crowd had filled the beachfront laughing out loud watching the performers. We watched the show for about thirty minutes and had our dinner in Buena Lynn’s Restaurant. We had a heavy meal for P730 only. So affordable isn’t it? A quite walk along the shore was our next activity. I haven’t heard any negative reactions from my buddies since the moment we arrived. Even our little Shen didn’t utter any complain. I’m quite sure, everyone was having a great time. We didn’t swim anymore. We enjoyed watching variety of shows from various bars and restaurants. It was a free entertainment, so it was not surprising that the beachfront was packed not only by customers but with spectators too. We went back to our room around 10 p.m. and surrender our bodies for a retreat in bed. 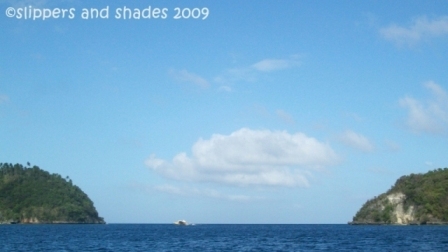 I was so excited for our island hopping the next day. Wishing everyone will enjoy again. After a fast breakfast at Buena Lynn ‘s resto, everyone was excited going back to the room to change our clothes to swim wear. 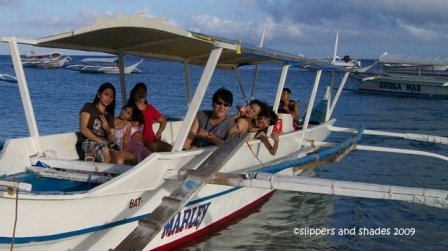 We took the same boatmen Tonton and Deck for our island hopping which Ate Marie referred to us last month. But previous rate of P1,500 increased now to P2,000. CORAL GARDEN – The weather was fine. The water was so clear and so calm. Little Shen was left in the boat for she was scared to join us. She just smiled when we all plunged to the water. I’m sure few more years from now she can join us in this exciting activity. I was so overwhelmed because my buddies were enjoying the experience under the water adventure. Colorful fishes swam near us when we fed them with bread. Angel fish of various colors were so delightful to see. I enjoyed more this time exploring the abundance of marine life on Coral Garden. 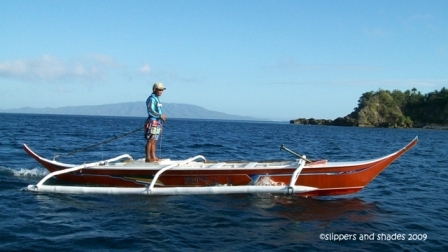 Still not satisfied, we hired a small boat and it thrilled us more to see the beautiful corals and fish. Miko and I were on the opposite support while Pao and his daddy on the other side. Since Isha was still little, she just sat on the boat while we were exploring the Coral Garden. The experience was indeed incredible. No regret paying P100/head for that amazing ride. HALIGI BEACH – We snorkel around the shallow part where water was so clear so we can guide our little kids. We had the place all by ourselves for few minutes. Later bathers flocked the island. We spent the moment basking from the sun. 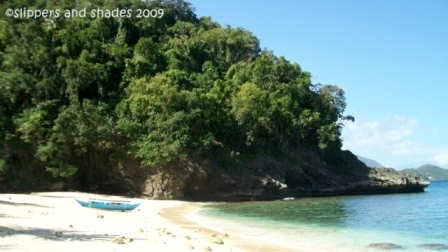 KABAYAN BEACH – It was almost noontime when we reached Kabayan Resort. The stifling atmosphere lowered our energy levels. So instead of wading on the water again, we took shelter from the trees and just enjoyed watching the crowd feasting on the clear blue water. 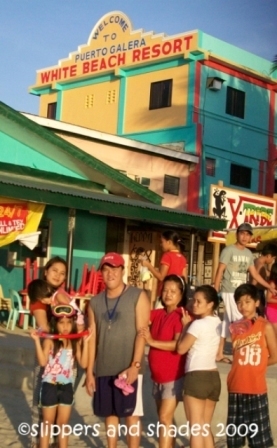 Everyone now was starving so we headed back to HSL Beach Resort. We had our lunch in Basilico Restaurant, few walks away from the resort. We had a leisure time in front of the restaurant after eating. Doing nothing, just watching the people passed by and those kids shouting for fun while wading on the water. It was a passing time that I will surely miss if I’ll be working on my paper works again. By 3 pm, my mother and I bought affordable t-shirts, ranging from P90 to P150 and souvenir items such as key chains-P35 and wooden fish for P180 on a nearby souvenir shop. “Yes!” That was the answer in unison from Miko, Pao Isha and Shen. The gentle breeze coming from the sea hailed them to sleep and so with Mama dear. My hubby and I exchanged glances, both were smiling. It was a heavenly feeling knowing every one of them had a great time in this beautiful island. 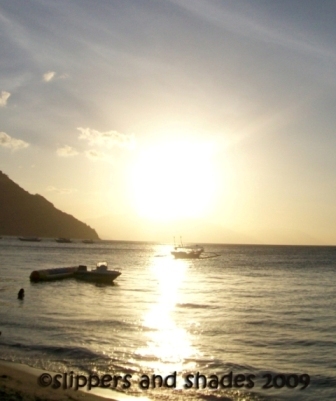 Puerto Galera has its own charm in captivating one’s senses. And going back is worthy of doing so. I’m sure this is not our last. 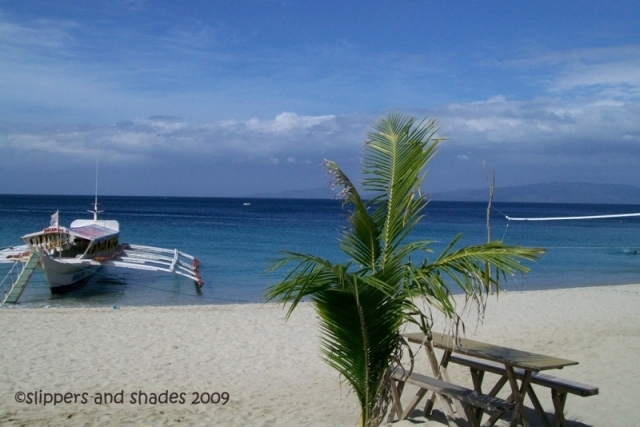 My hubby was so eager to go to White Beach of Puerto Galera when he heard my story about our Accounting Team outing here and got even more excited when he saw our pictures. He promised our kids that if he will enjoy his stay surely, we will go back with the whole family. We took the 6 am Jam Liner bus ride at Buendia terminal (P166.50/head). We arrived at Batangas Pier at 8:05 am. We paid P450/head for the boat fare (MV Blue Penguin) v.v. and P50/head for environmental user’s fee. The sun was beaming when we left the port at 8:30. But it rained when we were half of the trip. It was again an anchor’s away ride as we were welcomed by those unfriendly waves! 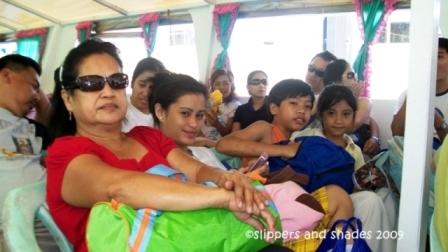 (but our roro trip in Cebu was more frightening than this). When we reached White Beach, sun was its highest mood again. Sudden change of climate, huh! We had a room reservation at HSL beach resort (recommended by Lei, my hubby’s office mate). 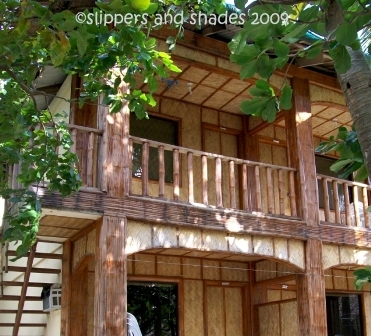 Walls and roof were made of native wood materials. It has private toilet, closet, tv and nice tiled floor. There were table and chairs in the balcony, good for savoring the sea breeze as well as viewing an obstructed view of the sea. Ate Marie, the manager of the resort gave us a discount. We paid P800 for the room instead of the daily regular rate of P1,200. Very affordable rate for a nice, cool resort to stay. 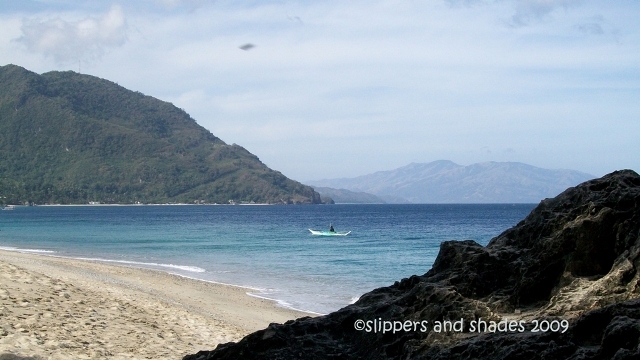 We ate our lunch at Basilico resto, a good spot to watch the sea and just a few distances away from HSL. We ate the usual Pinoy food like boiled pork (good for 3 persons), tortang talong (daddy’s fave), chicken kebab, sprite for my drink and Fruitas mango shake (P85) for my hubby. Our meal costs P285 only (excluding mango shake), so affordable but yummy. Since it wasn’t peak season yet the resto was not crowded with people. We had a leisure time watching the dazzling seas that restlessly aspired people like us. It was too inviting to swim but it was so hot to dip in the water by 12 high noon. We stayed there for an hour watching foreigners having fun in the water and those people roaming everywhere. Then we went back to our room and took some rest for a “walk attack” by afternoon. At 3 pm, we walked around at the back of White Beach albeit the stifling atmosphere and headed to Parkway grocery store to buy snack. We went back to our room and ate our snack at the balcony. 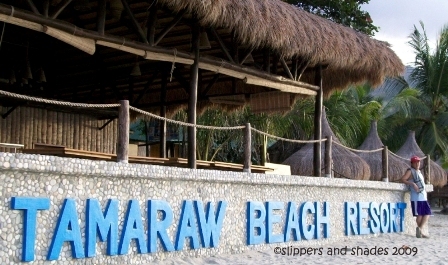 By 4 pm we headed to Tamaraw Beach Resort which Lei recommended us to explore as this offers a diverse relaxation compared to the noisy crowd of White Beach. This was just beside White Beach and could be accessed through walking along rocks of various sizes and shapes. And when we got there we found out that Lei was telling the truth. The resort had a quiet ambiance. There were only few people walking on the shoreline. For those who wanted to escape from the noise of crowd, the seclusion of the resort guaranteed a rewarding stay. The calmness of the surrounding will summon you to stay longer. Going back was now easy as we discovered the elevated concrete walkway. 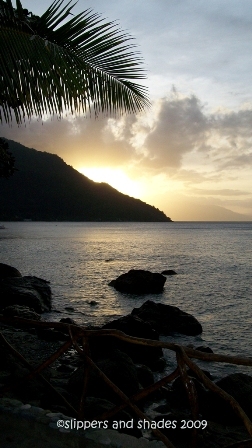 Before it gets dark, we proceeded to the right end portion of White Beach and waited there for the dramatic sunset. We ate our dinner at Hiyas resto. While feasting on the fresh grilled fish, we were entertained by funny gay performers. It’s like we were eating in a comedy bar in Manila only that they were not singing live. Even foreigners laughed out so loud. After the show we walked in the shoreline. This is a wonderful evening for there’s no maddening crowd and no big noise yet on the beachfront. And it favored me much for I am not a party people. We savored the night time solitude sitting together in the sand. There were only few stars that night. Later a boy band started to sing ballad and new waves songs. The cool breeze and the songs were pretty much enough to enjoy the night. It was a perfect quiet moment to contemplate on certain things. I was thankful that at least I rewarded myself (from stressful job haha!) 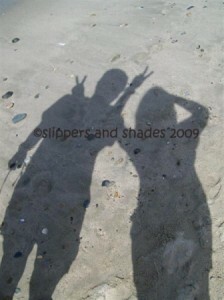 a wonderful beach escapade with my husband. I realized, it’s not only the places that you go but the people you spend with that will make the trip worth remembering. I am wishing that we could go back here with our kids.